In the mid 80’s, four kids barely out of school directed Tony de Peltrie, a computer-animated short that took the animation world by storm and revolutionized the film industry. 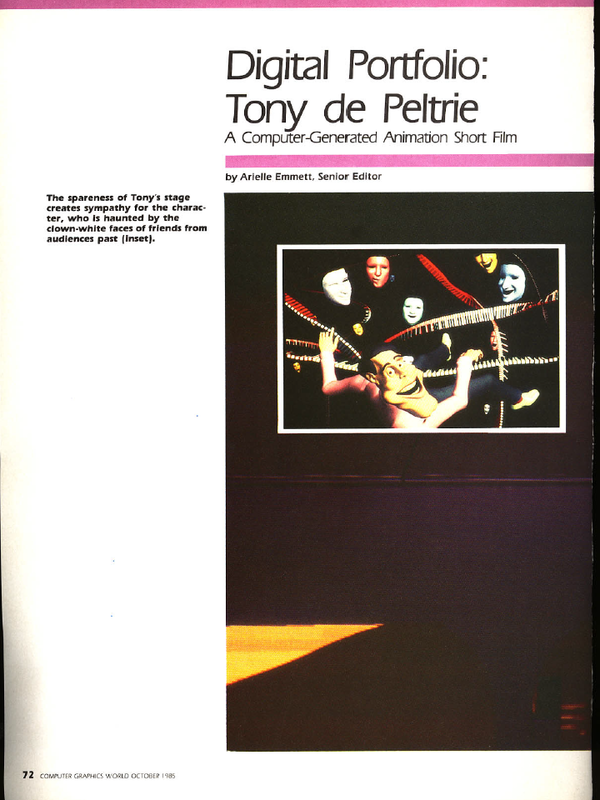 Produced by Pierre Lachapelle, and directed by Lachapelle, Philippe Bergeron, Pierre Robidoux and Daniel Langlois, Tony de Peltrie premiered as the closing film of Siggraph’85 – the largest computer animation festival in the world. “But the biggest ovations last week were reserved for. Tony de Peltrie. Created by a design team from the University of Montreal, it depicts a once famous musician. tickling the keys and tapping his white leather shoes to the beat of his memories. De Peltrie looks and acts human; his fingers and facial expressions are soft, lifelike and wonderfully appealing. 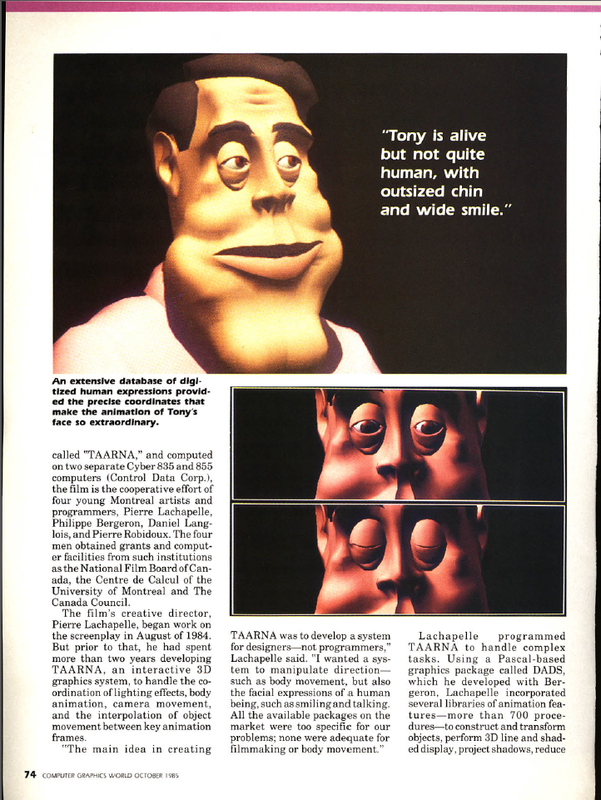 Bergeron P. (1985) Controlling facial expressions and body movements in the computer-generated animated short “Tony de Peltrie”, tutorial, SIGGRAPH 1985. This paper was part of a tutorial on animation and outlines a method of doing character animation. 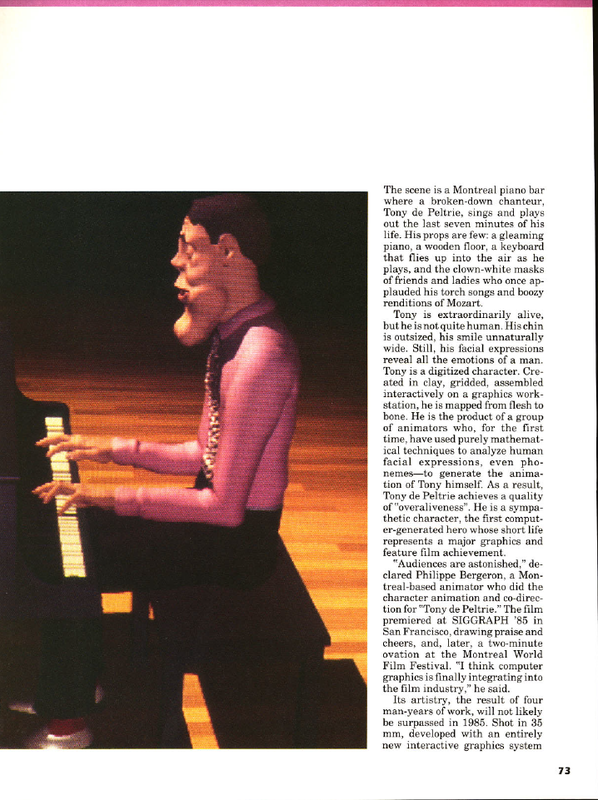 The example is a very well known piece of animation, “Tony de Peltrie”, about a piano player who is recollecting his glory days. Tony is not all that life-like in apprearance, but the animation is so realistic that by the end of the short, you are really feeling for him. The animation was done on a 3-D interactive graphics system, TAARNA, which has been designed for use by people with no computer background. To animate the character, there were two major things that had to be done. Firstly, the facial expressions need to be defined (muscle movements) and secondly, the body motions (skeletal movements) must be layed out. To get the required realism in the facial expressions, the animators photographed a real person doing 28 different facial expressions. The model had a grid of dark lines drawn on his face to correspond with the control points which would be on the animated figure. Only 20 of the photographs were digitised as the difference between some expressions is to small to warrant the time it would take to put them in. An example is the similarity between facial positions for “m” and for “b”. A clay model was made of Tony and a control grid was drawn onto it. The model was then photographed and digitised. The animators manually went through and matched up corresponding control points. This was not a simple matter as the grid on Tony’s face had a lot more points than the human model so a one to many relationship between the points had to be created. This caused a few problems with the animation which had to be ironed out later on. Bergeron used an algorithm by Kochanek (SIGGRAPH, 1984) for interpolating between keyframes. This gave the freedom to choose and combine expressions and reduce or exaggerate them for added effect. The speech sequence was recorded onto tape, then the timing for the speech was noted. The timings for the speech were copied onto dope sheets and then the synchronising of speech was done using techniques very similar to traditional cell animation. For the other parts of the face, a similar approach was taken although there weren’t as many key positions to record. For the eyebrows there were three positions, and for the eyelids, there were four positions. The body of Tony was modelled with clay and then digitised as had been done with his head. The skeletal data, the hierarchy of body parts and where they bend, was done through TAARNA. TAARNA has five commands for skeletal manipulation: bend, twist, pivot, stretch and rotate. For each of these commands, the limb, the point of movement, and the degree of movement need to be given. The animator has to check that the movements are valid as TAARNA doesn’t check for impossible movements. To animate the body, there were three stages to be worked through. These stages are: specifying the key positions, interpolating between the key positions, and fitting the 3D model on each interpolated skeleton. This fitting includes putting the clothes on Tony and making wrinkles in the clothes when the body moves. Different, pretty good. Unique. Where are they now the authors ? I saw some excerpts of it on a documentation for german television (Das Bild das aus dem Rechner kam). It built the foundation of my desire becoming a 3D-artist. Some years later after DBW-Render and Imagine on the Amiga, Softimage|3D became the professional tool of choice. Thank you for refreshing these nostalglic memories! It’s hard to see it as a milestone with ‘modern’ eyes, but I’m sure it was incredible at the time. I read the entire article (except p.75 of the magazine which is missing). 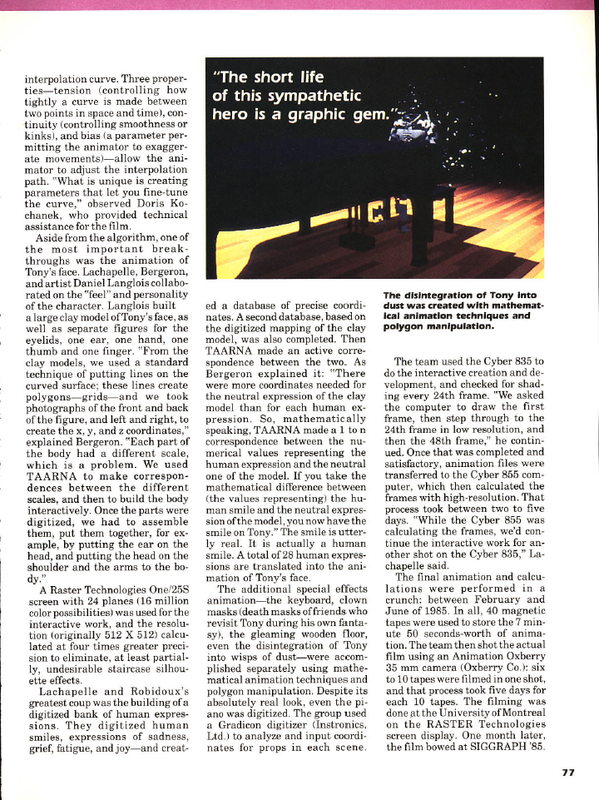 I’d like to know more information about the founder(s) of Softimage, it makes a refreshing change from the technical articles.